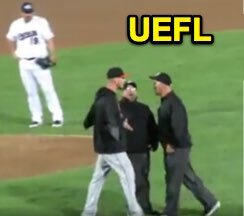 For the second consecutive day, a Long Island Ducks coach was ejected during the Liberty Division playoff series vs the Somerset Patriots, as HP Umpire Derek Moccia ejected John Brownell for arguing Jorge Teran's out call on the bases. Having lost its second consecutive game, ejectee John Brownell's Ducks moved into a 2-2 tie with Somerset in the best-of-five series. Report: HP Umpire Derek Moccia ejected Long Island Ducks Pitching Coach John Brownell* (1B Umpire Jorge Teran's out call [non-pulled foot]; QOCY) in the top of the 7th inning of the Ducks-Patriots game. With none out and none on, Ducks batter Lew Ford hit a ground ball to Patroits shortstop Alfredo Rodriguez, who threw to first baseman Jayce Boyd as Ford arrived at first base. Replays indicate that as Boyd leapt in the air to receive the throw, his foot broke contact with first base, but appeared to return to a legal tag of first base prior to Ford's arrival, the call was correct. At the time of the ejection, the Patriots were leading, 5-2. The Patriots ultimately won the contest, 5-3. Teran ejected Ducks Manager Kevin Baez during Game 3 of this same Ducks-Patriots series. Related Post: Indy (Atlantic League) Ejection - Jorge Teran (Kevin Baez) (9/21/18). *Brownell is a pitcher in the Long Island organization who is presently on the Disabled List. He is listed on the LI staff as a Pitching Coach for the 2018 Atlantic League postseason.